I've heard a lot about the book Bridal Couture by Susan Khalje, for it's couture sewing techniques with evening wear, I can't be beat. Unfortunately it is out of print and if you can find a copy it is well over $100, a new copy on amazon is selling for $355! That's a little crazy, even for a person like me, obsessed with sewing. I really wanted to learn from this expert, and amazing teacher. I love here articles in Threads, and my favorite blogger, Gertie's camp couture posts. 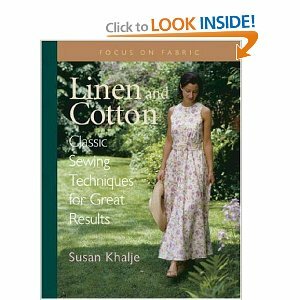 As an alternative I bought this book : Linen and Cotton: Classic Sewing Techniques for Great Results by Susan Khalje, for only $3.60 on amazon. It has a million amazing tips, and I certainly sew more with cotton than I sew evening dresses. If only I had more evening things to do! I can't wait to do some of the decorative details from this book. Pin It Now!